It’s no surprise payroll capabilities are one of the top requirements for HR software buyers. Businesses of any size have to make choices about how to handle the daily work of payroll management. There’s constant representing of earned wages and getting money into employee accounts — and there’s the long-term responsibility of filing payroll taxes and keeping annual records. Companies can choose to do payroll manually, or they can employ various kinds of modern payroll software packages. They can also choose to outsource all of this financial work to a payroll service. Here are some of the considerations companies think about when determining whether to keep payroll in-house using payroll software tools or let a third-party company handle payments, tax work and more. Payroll software packages also come with their own benefits and disadvantages. While there are some processes that these types of software handle well, there are also some drawbacks to using a payroll software package to handle payroll operations. Managers and leadership teams have upfront access to the payroll operations through the platform and can tailor the software accordingly. If anything needs to be adjusted, authorized users can immediately open up the payroll software and make the necessary changes with no barriers preventing access. In contrast, businesses that employ a payroll contractor need to contact said company to change any of their processes. This can have a much longer turnaround time for crucial modifications, in comparison to the quick-fix benefit of an internal payroll system. Businesses don’t have to worry about third parties poking around their finances or getting data such as employee Social Security numbers or identifiers. Keeping payroll processing under the umbrella of in-house systems, as opposed to outsourcing the function to a payroll service, is generally more secure. With payroll software, businesses can manage access rights to ensure only the most critical employees are able to use the system and view the information stored within. Many of these software packages offer a mobile-first design and online delivery architecture. With these capabilities, internal people who need access to payroll data can get it from wherever they happen to be. As mentioned, using a payroll service limits a business’s ability to perform their own payroll functions or make changes, so mobile capabilities are practically nonexistent if your company isn’t using payroll software. Software vendors can help with automatic updates or provide other types of services, such as adding different kinds of service modules. Having access to vendor assistance through payroll software provides some of the benefits of a payroll service, such as expert know-how and troubleshooting. Many of these payroll software packages can require quite a bit of training for internal staff members. It may take time for employees in your human resources department to figure out how to do various payroll tasks and become fully efficient. Conversely, a payroll service can reach this point immediately due to their professional knowledge. Human error is a big downside to consider for payroll software use, as opposed to hiring a payroll service contractor. Internal people can end up missing forms or getting numbers wrong. The business will be responsible for all of these mistakes, and fixing them can be time intensive and costly. Companies should look at the fees attached to payroll software products to make sure they’re not excessive in terms of the actual value that the company will be getting out of the system. For companies that want hands-off payroll operations, third-party companies are willing to take over all aspects of payroll processing. This includes handling either employees or contractors and making sure that all workforce finances are in impeccable order. One of the biggest advantages of using a professional payroll service is that managers and leaders simply don’t have to worry about the details. This frees them up to focus more on core operations and growing the business. It can be a very efficient way of delegating tasks and outsourcing time-consuming busywork.  Professional services also give more assistance than what can be found in a software package. One of the best examples is in the area of tax filing. An annual tax filing for businesses is a complicated affair — it’s not something that’s easy to do only on paper. It’s very relational and can involve a lot of decision-making. With that in mind, professional services are able to offer more assistance than software packages, which require a lot of strategy and strategic use by client companies. One of the biggest downsides of hiring a payroll service is the cost. Companies that can get by with payroll software and in-house operations can save a great deal of money. In addition, companies can use subscription pricing models to get access to payroll software at affordable prices. They can budget these subscription prices into their operating costs. Some companies also offer bundling. For instance, Intuit is one of the most popular business payroll systems that offers bundled services for other kinds of accounting work that help businesses save even more money. 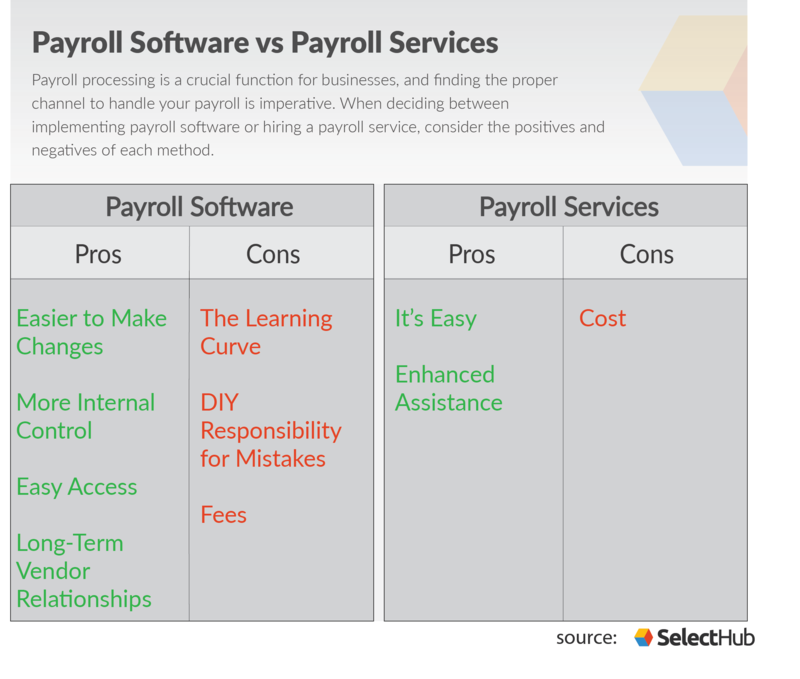 Along with the above pros and cons, there is also the idea that payroll software products are often embedded in a greater suite of human resources software. This is an important thing to think about when choosing what kinds of business IT architecture to go with and whether to use payroll software or hire payroll services. Many integrated human resources management software platforms have payroll built in. They also have integrated resources for training, attendance tracking, scheduling and payments. They may even have portals for self-service data, where employees can access their financial information, and other features such as conflict resolution tools. This is something to think about when making choices about IT architecture for an enterprise. Making the choice between implementing payroll software or enlisting the assistance of payroll services depends on the needs of your business, as well as your existing processes. Review the pros and cons of both types of payroll processing methods in relation to these considerations. Factors such as security and access, budget, and the skill level of your workforce in the realm of payroll processing are all major parameters to think about during decision making. Payroll software and payroll services differ greatly in their attention to these elements, so having a strong grasp of your current business climate simplifies the choice. Definitely agree that there are pro and cons to both resources, and it really just depends on the size and complexity of your company, as well as your accounting personnel. If you are a small business looking for low-cost payroll sofware, I highly recommend Advanced Micro Solutions. Outsourcing is definitely the lazy managers choice especially if you have unqualified or under trained staff, its their easy button. However if you hire professionals software gives you more flexibility and integration points that can save many hours every pay cycle.